There are two main ways of creating a new review request: through the web UI and through rbt post. We recommend the latter, as it does a lot of work for you, and is actually required for some version control systems, such as Perforce. RBTools is a set of command-line tools that can be installed on each client system. There are many tools in the RBTools package, but the most important one is rbt post, which will look into your development directory and post changes to Review Board. Using RBTools is the recommended way of posting changes, and for some version control systems or hosting services, may be the only supported way (due to the built-in diff tools generating files with insufficient information). For more information, see the RBTools documentation. To post a review request through the web UI, click New Review Request in the upper-left of a page. This will take you to a page where you can create your review request. On this page, you are presented with a variety of options for creating a new review request. On the left-hand side is a list of all the repositories configured on the server. The first step in creating a new review request is to select one of these. Because some large Review Board servers may have dozens of configured repositories, you can search for the one you want by clicking the magnifying glass. When doing pre-commit review, your review request will represent a pending change which is not yet present in a central repository (for example, a working copy in Subversion or a local branch in Git that has not yet been pushed). If you’re not using rbt post, you’ll need to create a diff file by hand to upload the change to Review Board. The diff you provide needs to be in unified diff format, and must have revision information embedded in the file. CVS, Subversion, Git, Mercurial and Bazaar provide this information. If you use Perforce, though, you’ll need to use rbt post instead of the web UI. Note that this means you can’t just use a standard diff generated by the diff tool. You’ll need to consult your version control system’s documentation for information on generating diffs. Once you’ve created your diff, select a repository. You can then either drag-and-drop your diff file onto the top section under New Review Request for Pending Change or browse for it using the Select button. In most cases, once you’ve selected your diff file, the review request will be created. For some types of repositories, you may be prompted for additional information. The changeset number representing the change the diff is generated from. The relative path of the directory you were in when you generated the diff, based on the repository. For example, if you locally have a checkout of trunk/reviewboard named reviewboard, and that was the directory you were in when you made the diff, then the base diff path would be /trunk/reviewboard. This may also depend on how Review Board was configured. Consult your administrator if you have problems. The web UI now allows you to create review requests for post-commit review. This feature is not available for all types of repositories. 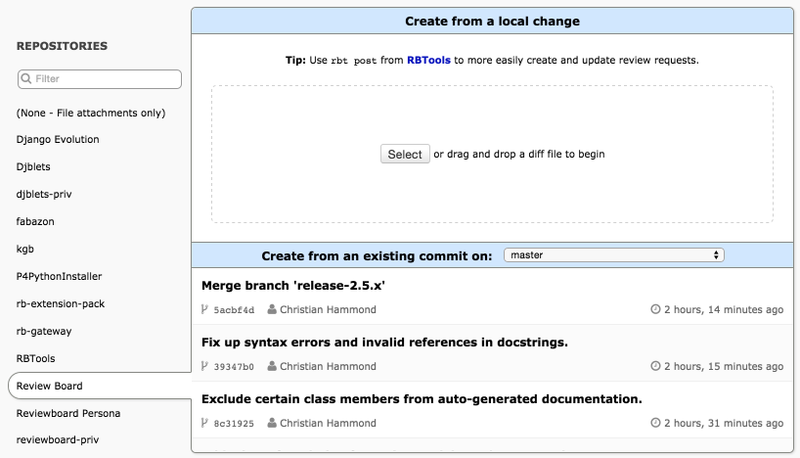 If you do not see the “Create from an existing commit” section of the page, you must use rbt post to post committed changes. Once you select a supported repository, the bottom half of the “New Review Request” page will have a table labeled New Review Request for Committed Change. By default, commits are shown for a default branch (like “trunk” in Subversion or “master” in Git). In the header is a drop-down box which allows you to switch branches. Below the header is a list of commits on the selected branch, starting with the most recent. As you scroll down, that list will update automatically with older changes. To create a post-commit review request, just click on one of the commits. Review Board will download the diff and change description and prepare a new review request. From there, just assign reviewers and publish. If a committed change already has a review request, this will be denoted with an icon. In this case, clicking on the commit will jump to the existing review request rather than creating a new one. If you’re intending to post a review request only for reviewing file attachments, select (None - File attachments only) on the left-hand side. You’ll then be presented with a button to create a blank review request. You will not be able to add any diffs to this review request, but after creating it, you will be able to add attachments. No other fields will need to be provided when using this option. Once you’ve posted your initial diff through the web UI or rbt post, you’ll have a draft of your review request posted. Nobody but you will be able to see the review request until you publish it. Before you publish the review request, you’ll need to fill out the summary, description and reviewers. Some of these fields may be filled in depending on your repository type, the tool you used to post the review request, and any defaults your administrator has set up for the reviewers (see Default Reviewers if you’re the administrator). File attachments can be added with the Update ‣ Add File menu item or by dragging and dropping files onto the page in the browser. You can preview your diff by clicking View Diff in the review request action bar (in the top-right of the review request). Uploading a new diff (either using the Update ‣ Update Diff menu item or with rbt post) before publishing will replace the diff. When you’re finished, click Publish Review Request in the green draft banner above the review request. You can also choose to discard the review request by clicking Discard. Depending on your particular setup, publishing a review request may send an e-mail out to the reviewers, letting them know your change is ready to review.